The redesign proposal of this existing restaurant entailed a number of changes to bring the space up to date. Envisioned as a high-end, contemporary French restaurant with an extensive wine bar, the space was significantly opened up volumetrically and a dramatic curved stair was situated in the center of the space. Low horizontal banding across the windows were removed and the ceiling was carved out to increase the feel of the interior space. Linking the higher ceiling to the accented main ceiling mass were copper mesh fabric swatches, springing from the newly enlarged spaces above the windows. 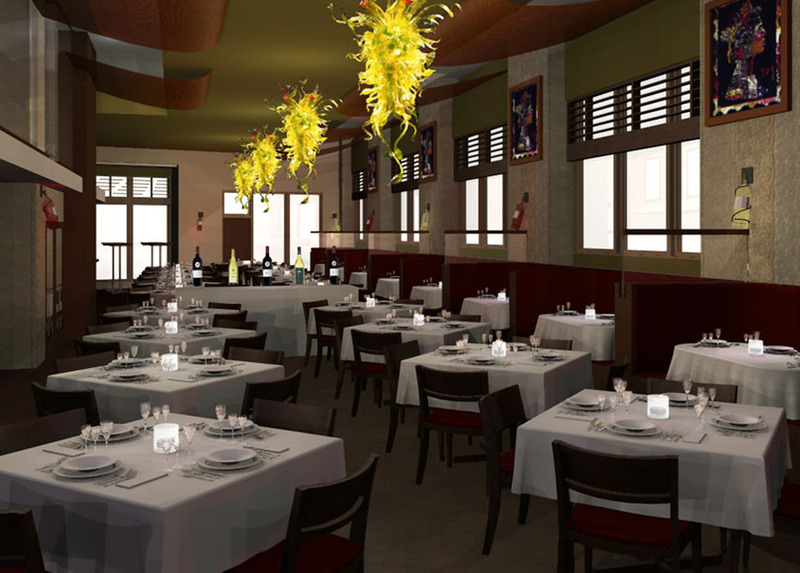 Running the length of the main dining area are a series of modern glass art chandeliers and wall mounted decorative, light fixtures made from alternating white and red wine bottles. Additionally, a new access point to an outdoor eating area in the middle of the Wrigley Building's outdoor courtyard was added.